Long before the ‘Swartland Revolutionaries’ discovered the area’s propensity for great wine Swartland Winery was already making it. Swartland , meaning the black land, refers to how it looked to the first travellers whosaw it covered by indigenous low bushy renosterbos vegetation which looks black from a distance. When I first visited them fifteen years ago Swartland Winery was the largest under one roof in South Africa and it was really impressive to see the size of the operation. I first met cellar master Andries Blake, along with Abrie Beeslaar who went on to take over the winemaker’s baton at Kanonkop from Beyers Truter. Beyers often said that Andries had made more Pinotage at Swartland than he, Beyers, ever would. Swartland Winery became partners with American wine giant Gallo to make their Sebeka range of South African wines. 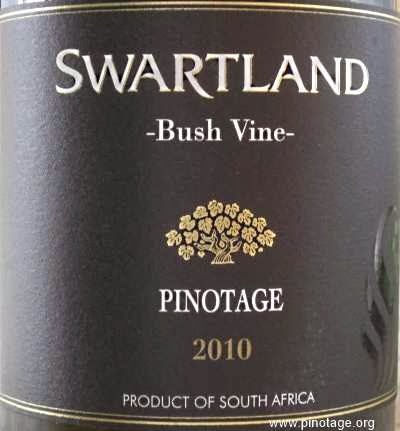 But Swartland Winery doesn’t just make large volume wines. 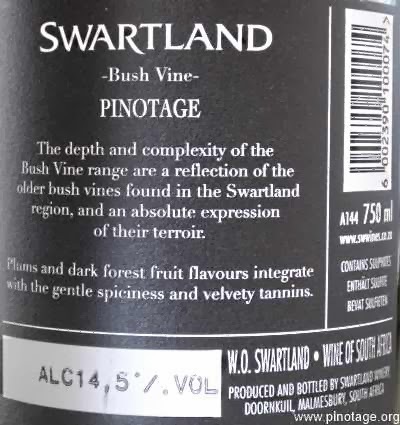 This excellent Bush Vine Pinotage is one such ‘boutique’ wine. Crafted on Andries Blake’s watch, it’s a sublime example of a fine wine where fruit and tannins are in perfect balance. Great mouth feel with a dash of Pinotage sweetness on the finish.